Pamela became a CASA in 2012 and has advocated for over 11 children. In addition to her advocacy, she served as a volunteer recruiter and spearheaded the development of the mentorship program. I wanted to use my background and skills to make a serious difference in the lives of children. I have learned that because we see many different perspectives we are able to bring new information to the decisions regarding children’s welfare and sometimes we are able to help a child get into a much better situation. I paint and lead a dance class for older women. I absolutely can’t live without opportunities to sing jazz. I would like to meet and talk with my great great grandmother and find out what her life was like and what she dreamed of for life in the future. Is how much I have enjoyed working with the CASA staff and fellow CASAs in my contractor role within the CASA Program. It has been a privilege and joy to not only help make life better for the children but my fellow CASAs and CASA staff as well. It is my intention to help create a stronger connection among CASAs and staff so that we can support and inspire each other in this very important work. There is a huge need for children in the foster care system to have an advocate to speak for them. I feel that in order to work on the adult addiction and mental health issues in our population we must look at how to help the kids that could grow up to be vulnerable to those issues. Kids in the foster care system live in a world where neglect and abuse are normal. That is not a world I want to live in. 1,405 miles (round-trip). One of my kids was placed out of state (per my recommendation). I had the pleasure of visiting last month. I got to meet with the teachers and other caregivers involved. It will make my next report easy to write! It was so great to see my kid in his new home. The possibility of a bright and stable future is worth any travel time. UH, I married my husband a couple of years ago and we each have 3 children from previous marriages. With 6 kidlets (ages 10, 12, 14, 15, 19, 21), work and being a CASA, I don't have much free time, which I prefer. My father does come up with beautiful and amazing motorcycle rides that we take on our Harleys any chance we get. My phone first. Laughter second (mine or yours). My phone allows me to manage work and our hectic life from anywhere. Laughter makes it all worth it. Iron Man. I like a self-made superhero that has flaws and a sense of humor. In Sheep's Clothing: Understanding and Dealing with Manipulative People. I always have something not so serious to read as well. The next book in the Stephanie Plum Series by Janet Evanovich is always on my kindle. It may be only for one kid at a time, but I can make a difference. When did you become a CASA and how many cases have you taken? I became a CASA about 4 1/2 years ago and have had 16 cases. I have always loved working with children and families. Interestingly, a friend, who is a lawyer, suggested that I become a GAL about 33 years ago. He did some pro bono work as a GAL, but I was just starting my family, so didn't feel I had the time. But I never forgot his suggestion. What has been the most rewarding part of your CASA work? Definitely the people I have met, from the tiny babies, to the truly amazing foster parents, to parents who have worked so hard to change their lives, the wonderful CASA staff who so graciously put up with my questions, confusion, sometimes lateness and the other great CASAs I have met. I just finished a book by one of my favorite authors, J.A. Jance. If you like mysteries, she is great. I also recently read "3 Little Words." I highly recommend it. "They don't care what you know, till they know that you care." What advice do you have for other CASAs? Keep plugging away. Stand up for what you think is right. Don't let social workers or defense attorneys intimidate you. Ask questions. If you aren't getting what you need from a social worker, go to their supervisor. Go higher to the AAG on the case if you still are not getting what you need. And above all, have fun. I heard an advertisement on a local radio station. I was a few months away from retirement. I was looking for something to not only keep me busy but also in some way help people improve their lives, be that mentoring or giving sessions on interviewing for promotions. The CASA advertisement reminded me of some work I used to do with children. I figured the training was free, so I would give it a try. This is very important work. I learned how important it is that the children have a voice when they are removed from their home and/or are caught up in the foster care system. Seeing that these children have a safe and stable home is more than just words, but a commitment. Many times it takes the CASA's voice to push for cultural awareness for the children as the other players' attention is split in too many other directions. This is also true for the "best interest" of the child. I also stay because the children need a consistant face and voice through the term of a case, which can run from two years and much longer, and go through quite a few staff changes or foster homes. A more political reason I stay is because I see a need for not only more men as CASAs, but for men of color. This is an area that is difficult to fix, but can make a huge difference to some of the families involved. (who has free time?) - I read (just finished "Tears We Cannot Stop" by Dyson), I am into archery (not hunting) and riding my motorcycle (I am a fair weather rider). African Proverb: "Until the story of the hunt is told by the lion, the tale of the hunt will glorify the hunter." I usually just say "when the Lion writes" which is taken from a play I did years ago. 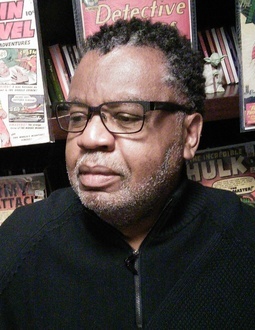 I have been a comic book collector for 50 years/ Married 44 years/Theatre major in college. Patience and respect. Respect for all the various parties that have to come together to make these cases work, from the CASA staff, DSHS, the AAGs, and the Commissioners and Judges. Also a respect for the resilience of the children I have worked with, who have gone through unbelieveable trials and tribulations, and for the most part are able to bounce back.